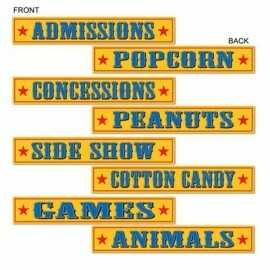 Circus Time Hanging Cutouts Cardboard 86cm in length & 18cm Cutouts Pack of 3..
Cutouts Circus Signs (10cm High x 60cm Long) Cardboard, Printed 2 sides with different designs. 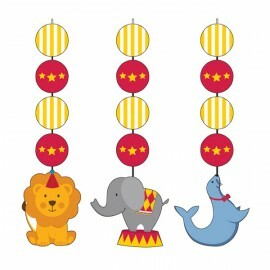 Pack of 4.. 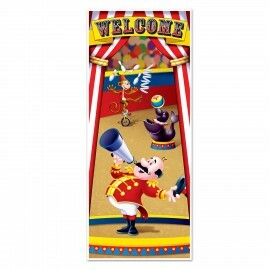 Door Cover Circus Tent Plastic 76cm x 1.83m Indoor & Outdoor Use Each.. 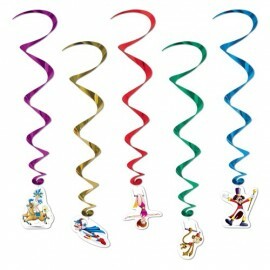 Hanging Decoration Whirls Circus (Approx 87cm Drop) Acrobat, Monkey, Ringmaster, Human Cannonball & Horse Trick Rider Pack of 5..